Even though this is an English-speaking community, there are many non-English-speaking companies recruiting through the users' Developer Story tab. For example, in the Developer Jobs tab, job offers that are written in German or French can be found. A milestone will do for specifying a language proficiency certificate in the Developer Story tab, but how would be the proper way to specify a user's estimated language proficiency in the Developer Story tab? It seems that there is no specific field for that. Unfortunately, at this time, there is no dedicated field on developer story for natural language proficiency. We've gotten similar feedback from both sides (employers and candidates), and it is something we're actively working on and hope to have an update in the near future. Not the answer you're looking for? 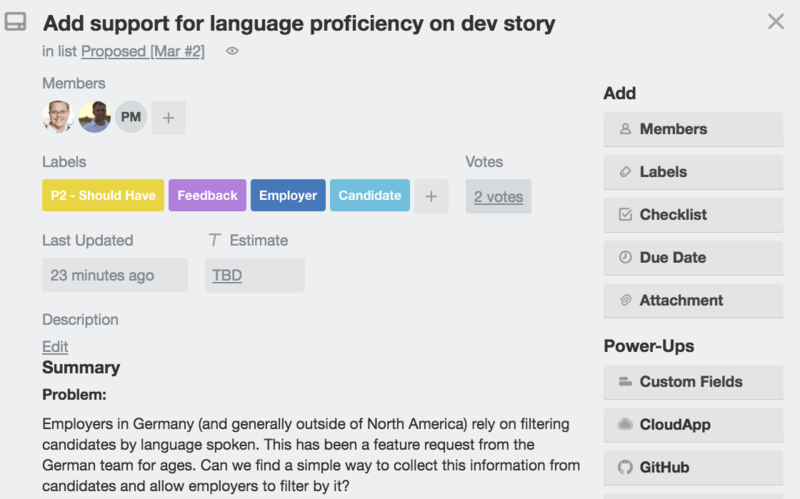 Browse other questions tagged feature-request status-planned developer-story languages .